Rumor Flies comically addresses the origins, evolution, and veracity of your favorite rumors, myths, and misconceptions. Tune in every week for more research, stories, and unsolicited commentary! Participation encouraged. 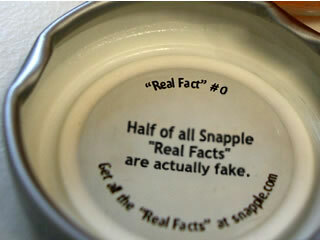 403 - Snapple Fact Check! Fact #14: "Camel’s milk does not curdle"
Fact #27: "A ball of glass will bounce higher than a ball of rubber"
Fact #46: "Elephants are the only mammals that can’t jump"
Fact #57: "You blink over 10 million times in a year"
Fact #77: "No piece of paper can be folded more than 7 times"
Fact #86: "Until the 19th century, solid blocks of tea were used as money in Siberia"
Fact #98: "When the moon is directly overhead, you weigh less"
Fact #237: "The number of times a cricket chirps in 15 seconds, plus 37, will give you the current air temperature"
Fact #123: "Beavers were once the size of bears"
Fact #250: Mongolians invented Lemonade around 1299 A.D. Fact #270: "Colors like red, yellow, and orange make you hungry"